Federation of Arab Engineers and IFP (International Fairs and Promotions) will jointly host a major summit in Baghdad this October to discuss the reconstruction of the destroyed cities in Iraq and Syria. The event will attract industry specialists including engineers, architects, contractors, vendors, investors as well as government officials, according to the organisers. The first edition of the “Reconstruction of the destroyed cities and restoration of archeological sites affected by military actions in Iraq and Syria - Conference” will be held on October 9 and 10 at the Baghdad International Fair Ground, in concurrence with the second edition of Project Iraq and Energy Iraq Exhibition 2018 with extensive international participation. The exhibition covers the requirements of Iraq’s construction market including: construction material and technology, electricity and power among others, said the organisers. 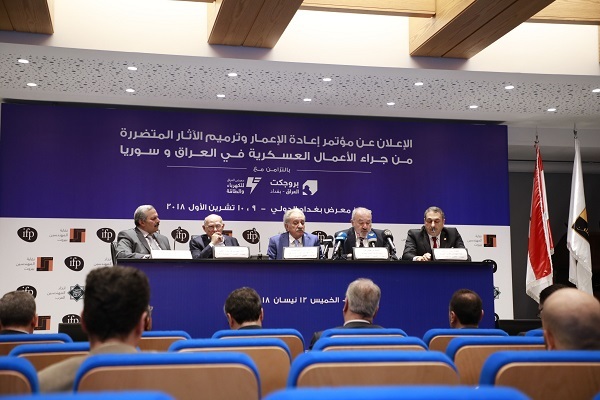 The announcement was made at a press conference held at the headquarters of the Order of Engineers in Beirut, which was attended by senior regional experts including Jad Tabet, the head of the Beirut Order of Engineers and Dr Ghayath Al Koutayni, the head of the Syrian Order of Engineers. Dr Adel Ibrahim Al-Hadithi, the secretary-general of the Federation of Arab Engineers, emphasised the importance of the Iraq conference and the federation’s full support of the event, while Tabet stressed his organization’s willingness to play an effective role in this conference. Albert Aoun, the chairman of IFP Group, highlighted the importance of the partnership with the Federation for the event, given that the federation is a professional organization with a deep-rooted history in boosting the engineering profession in the Arab world, preserving Arab engineering heritage and its impact on the advancement of civilization.